Cabinets were usually fitted with many drawers and used to store small curiosities. However, the inside of the Kimbolton Cabinet is an empty space with a door at each side. It was used purely for show and to display a series of pietra dura plaques on the outside. 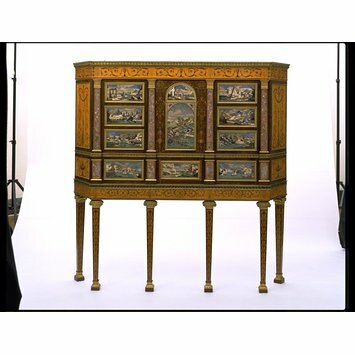 Although the marquetry and inlay are so lavish, the gilt-bronze mounts by Matthew Boulton cost even more than the actual cabinet. The pietra dura plaques include a selection of different marbles and hardstones. The first stage in preparing this work would have been to make a full-size working drawing. Paper cut-outs, traced from the drawing, were then glued to selected slices of stone. The stone pieces were placed in a vice and cut with a bow-saw, then placed face down on a flat surface. A single piece of slate was stuck to the back of the design to form a support when it was turned over. Finally, the front of the plaque was rubbed smooth with fine abrasives. This type of work had been a speciality of Florence since the 16th century. Kimbolton Castle was first built in 1525. It was remodelled by Sir John Vanbrugh (1664-1726), the playwright and architect of Blenheim Palace, between 1707 and 1710. Robert Adam, in addition to this cabinet, designed the gatehouse and entrance screen for the castle in 1764-1765. Cabinet of mahogany and oak with marquetry in satinwood and rosewood, designed to display eleven Florentine pietra dura panels made by Baccio Cappelli in 1709. It has ormolu mounts. It is so designed that the panels appear to suggest drawer and cupboard fronts, although the only real doors are the two in the angled ends. Inscribed into the back of the central door-shaped panel. Baccio Cappelli was active in Florence, Italy, 1700-1730. Designed by Robert Adam (born in Kirkcaldy, Fife, 1728, died in London, 1792). Commissioned by Elizabeth, Duchess of Manchester (1730-1832), for Kimbolton Castle, Huntingdonshire. Cabinet made in London by the firm of John Mayhew and William Ince; mounts made in Birmingham by Matthew Boulton (born in Soho, Birmingham, 1728, died there in 1809). 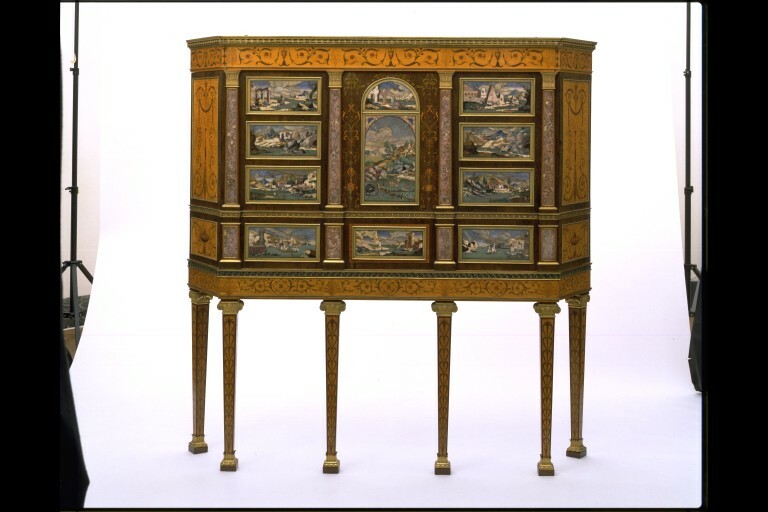 In a 1790 inventory of Kimbolton Castle, the cabinet was placed in the state bedroom, described as a 'cabinet of inlaid marbles, mounted in Ormolu, very fine'. Sold by the Duke of Manchester, Kimbolton Castle house sale, Knight Frank & Rutley, 18–21 July 1949, lot 314. Sold to the V&A by John Bly, Tring, 23 August 1949. 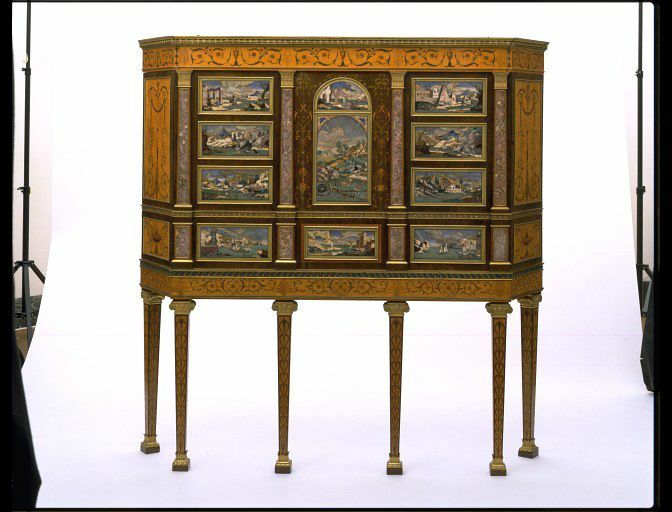 Kimbolton cabinet, designed by Robert Adam for Kimbolton Castle in Cambridgeshire, 1771-1775. Boynton, Lindsay (ed. ), 'An Ince and Mayhew correspondence', Furniture History, Vol. 2 (1966), pp. 23-36.